Product: This is a radio handheld controller for wireless remote control of locomotives and working items by means of the CS2 and CS3 central controllers. The large range also makes this controller usable for large garden railroad layouts. The graphic display has a high level of contrast and is easy to read even in direct sunlight. It also has background lighting for operation at twilight and night. Two (2) different locomotives / powered units can be controlled at the same time. They can be called up with the Central Station. Sixteen (16) or thirty-two (32) functions can be controlled, depending on the configuration of the CS 2 or CS3. Up to 4,095 turnouts and signals can be controlled. This controller can be used in analog operation together with the 51079 locomotive controller to control a locomotive / powered unit. 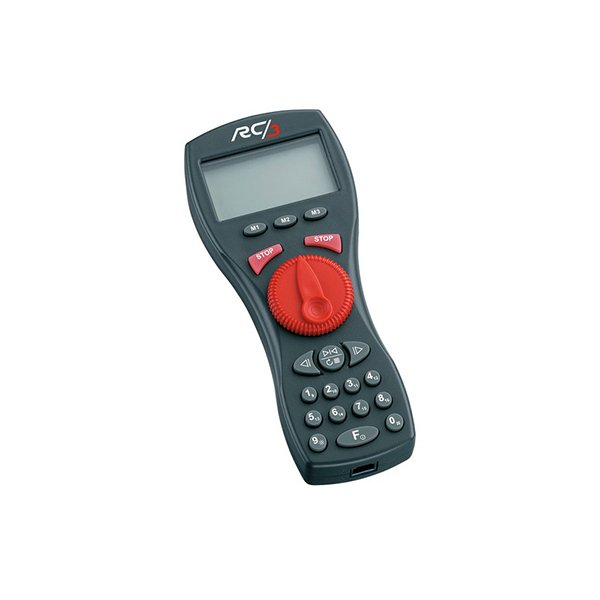 This controller can be updated with the RC3 radio receiver and the CS3. Three (3) AA batteries are required for operation. They are not included with this controller. A 55057 RC3 radio receiver is required for connection to the CS2 / CS3. This is not included with this controller. Size 185 x 80 x 35 mm / 7-1/4" x 3-1/8" x 1-3/8". Enables wireless control by means of radio communication. This controller can also be used for other scales, where the locomotives are controlled digitally with the CS2 / CS3.